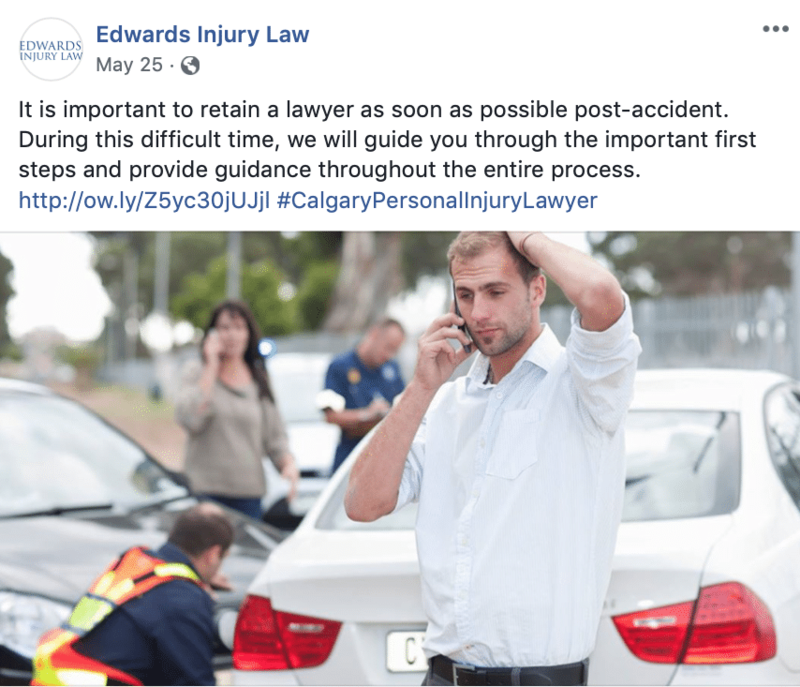 Edwards Injury Law is a Calgary law firm that specializes in injuries resulting from motor vehicle accidents, workplace negligence, and recreational injuries. Their staff are dedicated and personable with a desire to help clients receive the most compensation and the best representation in court. 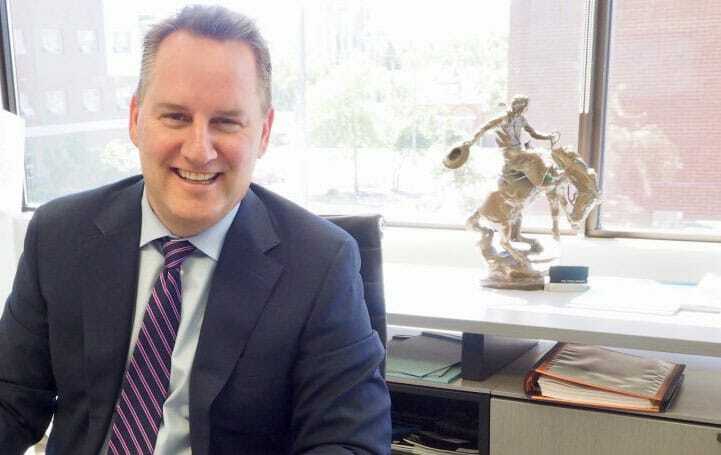 From brain and back injuries to psychological trauma, chronic pain, and even wrongful deaths and fatalities, Edwards Injury Law is experienced and qualified for the case. There are a number of lawyers in the Calgary area, and it can be difficult to stand out. When we began working with Edwards, their website did not rank at all on Google. Their site was in need of custom, professional design in order to organize the information and make it accessible for clients who are looking for a specific service. Edwards Injury Law also needed our marketing assistance for logo creation and online lead generation. Developing a unique brand that is accurate and engaging is always a top priority. As part of the services for Edwards Injury Law, we designed a new logo and revitalized their branding. Born and raised in Calgary, Edwards desired his logo to showcase his roots and highlight his character. The finished logo is a perfect blend of professionalism and personality; the bold sans-serif font stands as a testament to the client’s distinguished reputation as a lawyer while the accompanying graphic represents his identity as a native Calgarian. The new website for Edwards Injury Law is innovative and effective. Rather than listing his services on the homepage, the new website includes optimized landing pages for each service, taking full advantage of SEO. 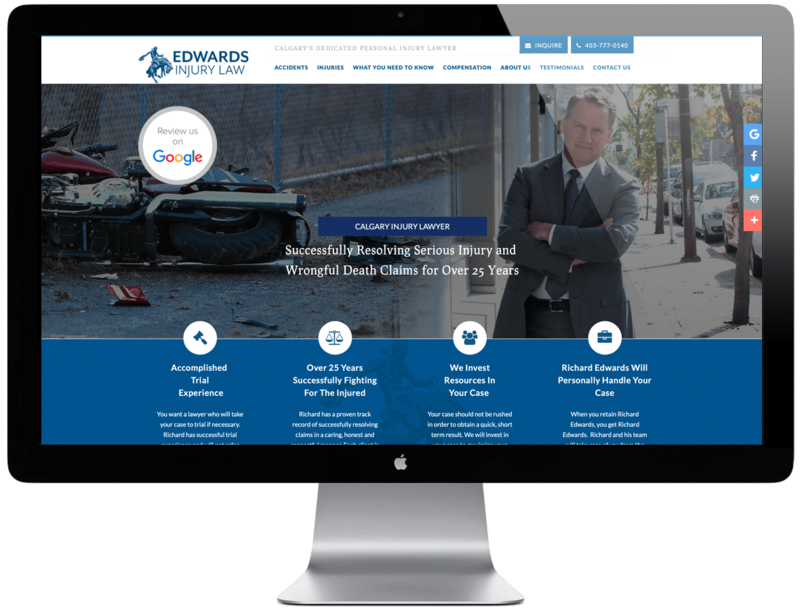 We designed the site to showcase what makes Edwards Injury Law stand out from competitors, highlighting his dedication to clients and his extensive experience. Not only does the site meet the needs and wants of the client, but it is also high-performing and extremely effective. The site now ranks on the first page of Google with nearly 600 visits per month. Too much information can be overwhelming for potential clients; moving the bulk of text from the homepage to individual service pages effectively made for a more streamlined and user-friendly experience. The site takes advantage of intuitive navigation, allowing visitors to find exactly what they are looking for without having to browse the entire site. Whether you are accessing it from a phone, tablet, laptop or desktop computer, the user experience is completely seamless. Edwards Injury Law was looking for more leads through online form submissions and phone calls. We saw overall website traffic increase by over 400% in only six months with the majority of leads and conversions stemming from online sources on a daily basis. 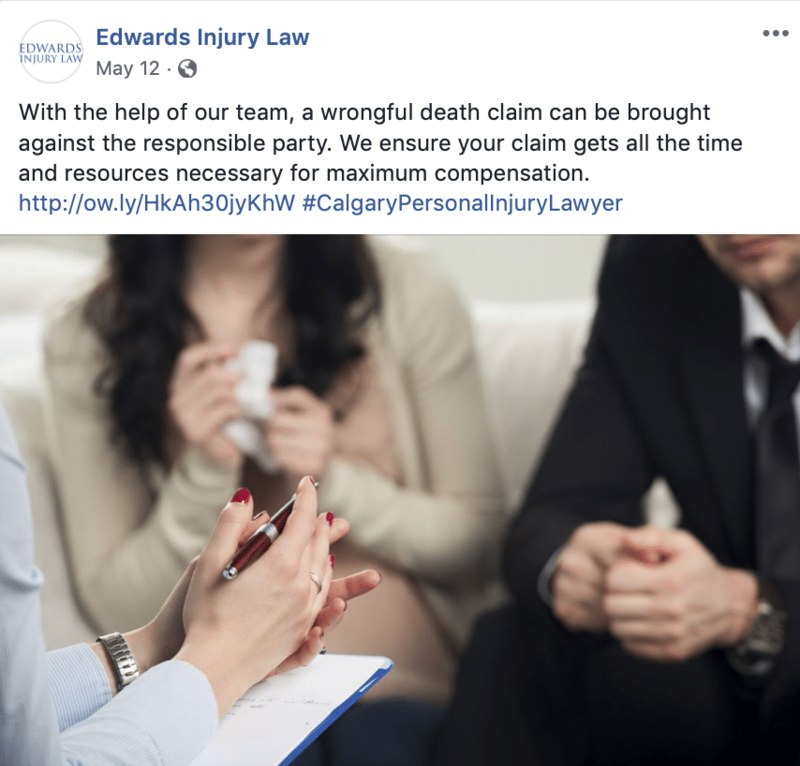 Our Google AdWords expert specializes in lead generation; she has developed advertisements to specifically target individuals looking for an injury lawyer in Calgary and the surrounding areas. Approximately ten leads per month result from these quality ads. 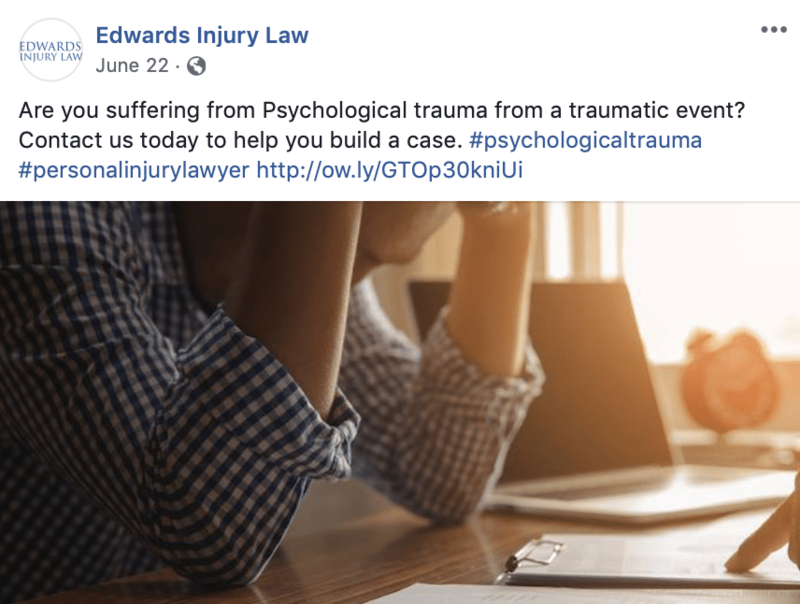 We provide continual support for Edwards Injury Law in the form of social media marketing, online advertising and more. Our talented writers and social media experts post multiple time per week on a variety of platforms as a means of supporting SEO efforts. Our posts maintain the client’s positive and professional image, increase brand awareness and facilitate client connection. 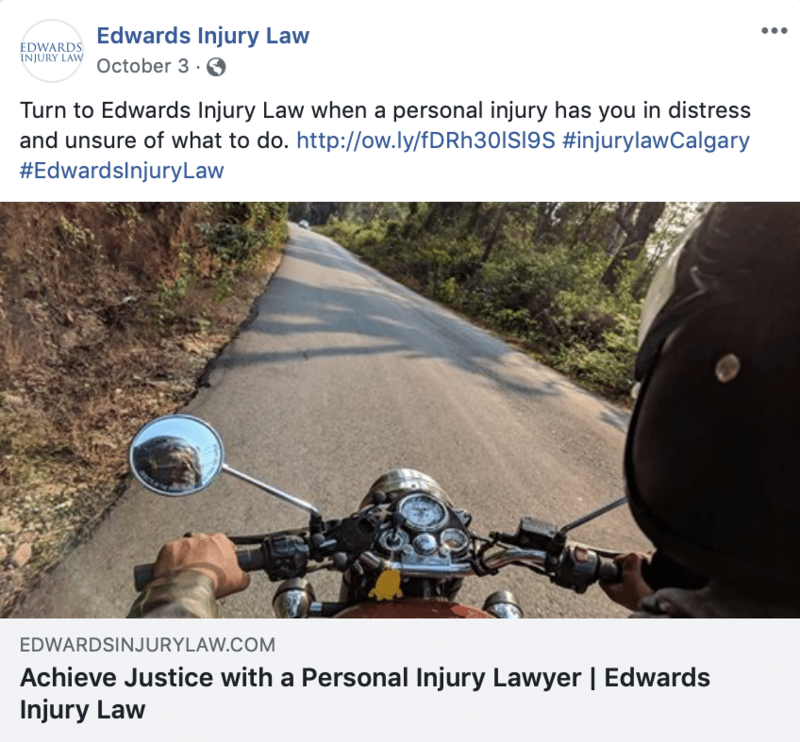 We market the availability and personability of Edwards Injury Law through an online presence on various profiles through organic like building, customer engagement, and interactive postings.